Tucked into the Sempervivum genus, there is a remarkable group of succulents called Sempervivum heuffelii. They're a twist on the classic semp rosette and they never fail to spark interest with their jaw-dropping shapes and colors. Gardeners, landscapers, and plant enthusiasts can't get enough of them because their no-fuss, low-maintenance growth makes them ideal for planting outside through a wide range of climates. However, many people do not know much about them, or even how to pronounce heuffelii (it's hew-FELL-ee-eye, by the way). With that in mind, we wanted to let everybody know ten reasons why we love these awesome hardy succulents! While most plants only show their best and brightest colors in spring and summer, S. heuffelii keep most of their color all year long. With a rich color palette of both jewel tones and pastels, they're a great way to add winter interest to any garden or outdoor planter. S. heuffelii are extremely forgiving of imperfect growing conditions. They will resiliently take root while you figure out a watering schedule and grow steadily in locations that are too sunny or shady for other succulents. They will even tolerate sunny indoor growing conditions better than most other hardy succulents. The shapes of these rosettes and the patterns they form as a group are remarkable. Many varieties have a bright, white outline of cilia hairs on the leaf edges that highlights their delicately curved form. Some appear to glow in the sun! You can read more about heuffelii division by following this link, but the bottom line for succulent gardeners is that you you can make cuttings to replant offsets or take a completely hands-off approach. They'll multiply and look fantastic either way! Heuffelii have an attractive growth habit of forming tight clumps, mounding colonies, and dense mats. As a clump grows and expands outwards, it makes a neat ground cover, filling in all the available space. Whether you forget about a planter or just want to go on vacation without pestering a neighbor to take care of your plants, S. heuffelii can handle it. They'll look great and save you time, water, and effort while they're at it. Residents of USDA hardiness zone 4 and up can confidently plant S. heuffelii in the ground as they are cold tolerant down to -30F. In fact, they overwinter best under a blanket of snow as it protects them from moisture and rot (more info here). Gardeners wanting to keep them inside through the winter will also see them thrive when kept by a sunny window. From yellow to purple, fuzzy to glossy, S. heuffelii will continually intrigue with a wide range of unique traits. There's such a beautiful diversity of colors, shapes, and textures represented that everyone can find the perfect plant to complement their garden. Heuffelii have tougher leaves than most succulents and are less susceptible to damage from weather and handling. 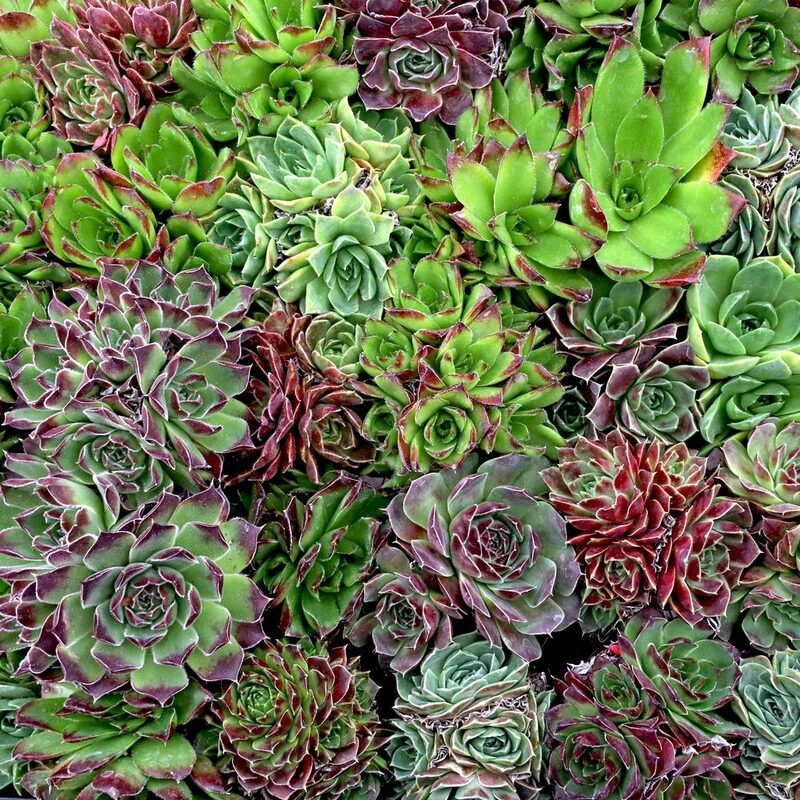 Each rosette can also live for many years as they tend to bloom less frequently than most Sempervivum. Their long life spans mean less maintenance work for you. Heuffelii are still tough to find in most garden centers and online succulent stores, so these eye-catchers are sure to make your plantings stand out from the crowd. Find your perfect heuffelii by browsing through our entire collection or save money and get a diverse assortment with the wholesale heuffelii trays. For something in between, try a set of nine different heuffelii cultivars! If you already have some of these extraordinary plants, show them off by clicking Submit Your Experience in the Customer Photos.